Otane is dry green/yellow peas. Randayi is a sidedish with coconut and is watery in consistency. Otane randayi is one of my all time favorite dish. Mainly because it has breadfruit in it. We make a lot of different such randayis with the same base(coconut, chilies), but depending on the vegetable or beans used in it, all of them taste very different. Few days back, I found a fresh breadfruit in Indian store. But I have heard they are readily available in frozen section of most of the Indian stores. Soak dry peas in water overnight. Cook peas in pressure cooker. Cook breadfruit with 2 cups of water (since it cooks very fast, do not cook in pressure cooker). Grind coconut with red chilies to a very smooth paste. 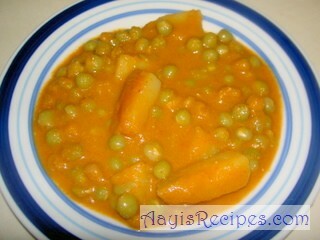 Add the paste to cooked peas and breadfruit. 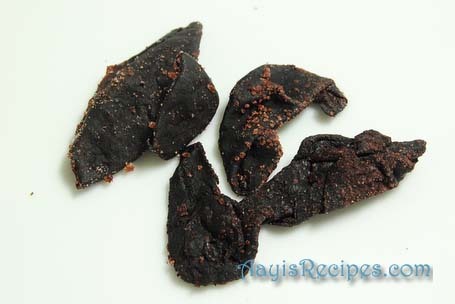 Add kokum, salt, slightly crushed teppal (crush teppal in 1 tbl spn of water and add. Do not crush it completly). Cook for around 8-10minutes. Serve as a sidedish with rice. I ate this dish at one of my Konkani friend’s house. All your dishes are yummy. This is such an interesting and unique recipe Shilpa, love the rich fall colors too! I have never heard of breadfruit. Is it different fron jackfruit. Where do we get it? Lakshmi, Thanks for your kind words. Lakshmik, breadfruit and jackfruit are different. Please click here. The first picture in the link is breadfruit. You might get the frozen, cut breadfruit in Indian store. Madhuli, breadfruit is very popular in South kanara, North kanara of Karnataka and also in Kerala. I am not sure if this vegetable is available in Maharastra. But once you eat this, you will never ever forget it :). To answer Madhuli’s question, it is known as “kaccha phanas” in Marathi and is available in Maharashtra. I tried the tinned variety (from Thailand) which is available in all Chinese\Asian stores, I tried this recipe the other day, except that I tempered it with garlic and curry leaves and it turned out very yummy..hubby just kept licking his fingers..
A friend gave me 4 breadfruits a couple days ago. Some are still hard, others are on their way to getting ripe. I’m not able to use them all right now. Question:can breadfruit be cut up and frozen before it is cooked? Thanks for your time.